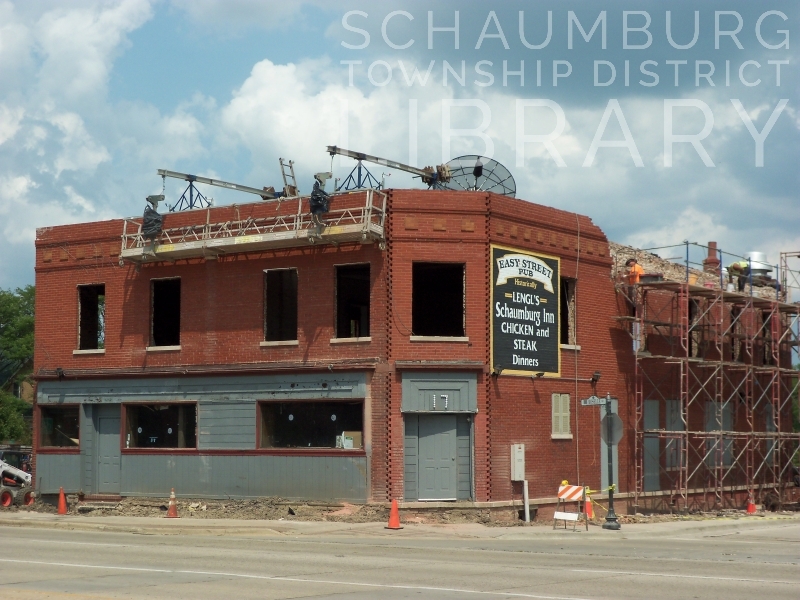 From the early days of Schaumburg Township, the building that is now Lou Malnati’s has been key to the development of the township. In the course of its history it has had many owners and gaps in ownership. The late 1920s was one of those gaps. When E. H. Diekman closed his general store in 1925, it appears to have taken a few years for it to reopen under another name. 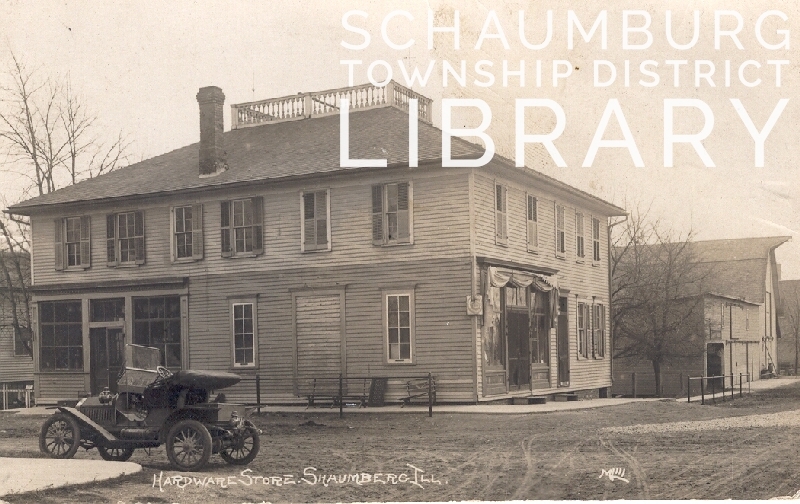 Later, in the 1930 Schaumburg Township census that was completed in April, it lists Herman Schnute as the proprietor of a restaurant. Sometime between February and April, Mr. Schnute began selling prepared food. Another ad from May 9 of the same year confirms that he introduced “Real Old Hickory Bar-B-Q in that tantalizing and inviting southern style” for the bargain price of .15 a sandwich. Ice cream, candy and pop were also available at the Schaumburg Store. Clearly he used “Schaumburg Store” and “Schnute’s” interchangeably. 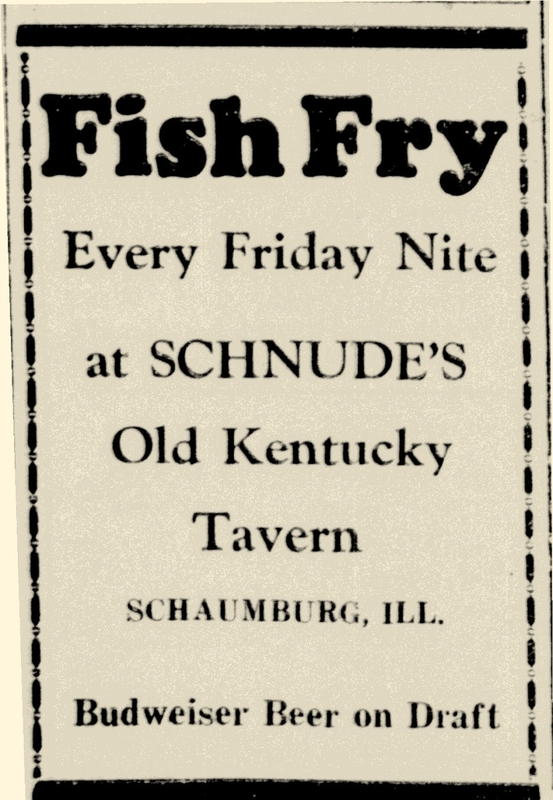 At some point, we know from our oral historians that the name of the establishment changed to Schnute’s Old Kentucky Tavern and this is confirmed in the ad below–even though Mr. Schnute’s name is spelled incorrectly. When he passed away in March of 1939 his wife Jennie continued the establishment and, in fact, is listed in the 1940 census as the operator of a tavern/restaurant. From the same oral historians mentioned above, we know that the next owner was George Nieman. We have a fairly good guess that he opened Nieman’s Hall in 1944 from an article in the November 4, 1949 issue of the Herald that states, “Mr. and Mrs. George Nieman are celebrating five years stay in our fair community. The shindig takes place from Nieman’s hall Wednesday night. An evening of music and lunch has been planned for those invited. The Niemans hailed from Chicago before they landed here five years ago.” Mr. Nieman is shown below in this photo from 1961. 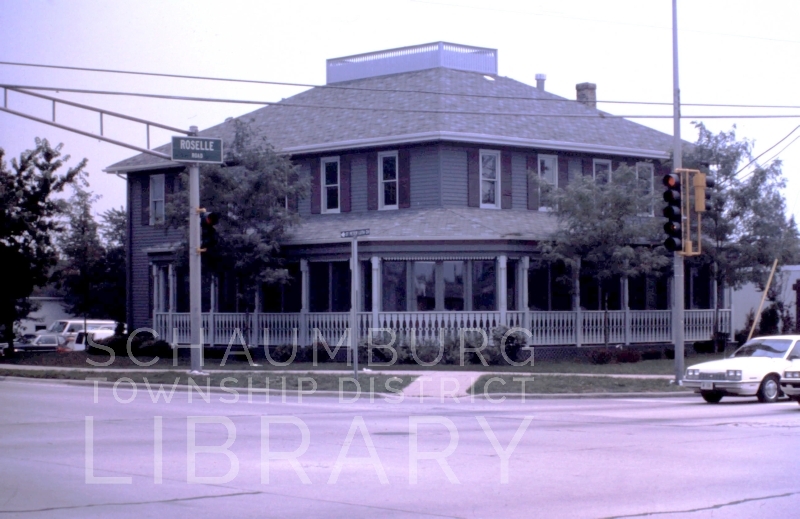 By 1957 the Niemans had renamed the tavern the “Schaumburg Inn.” This is noted in the 1957 Bartlett, Roselle and Bloomingdale phone book. 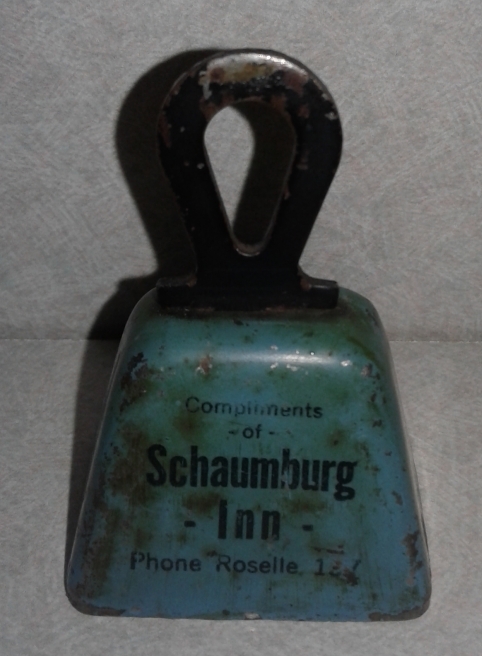 Then, in 1960, two Roselle brothers-in-law, Victor Binneboese and Wayne Nebel purchased the building and had their grand opening on July 17, 1960, advertising themselves as the Schaumrose Inn. It lasted as a local, popular institution for 25 years–by far and away the longest ownership of the building until that time. During their tenure they installed a mid-roof, brown vertical siding and shutters along with east steps. But, the biggest issue they faced was the proposed widening of the intersection from two lanes to four lanes. Discussion of the project began as early as 1973 or 1974, and very nearly happened in 1975. For the next few years a steady drumbeat was sounded by the Village of Schaumburg and the Cook County Highway Department to get the job done. 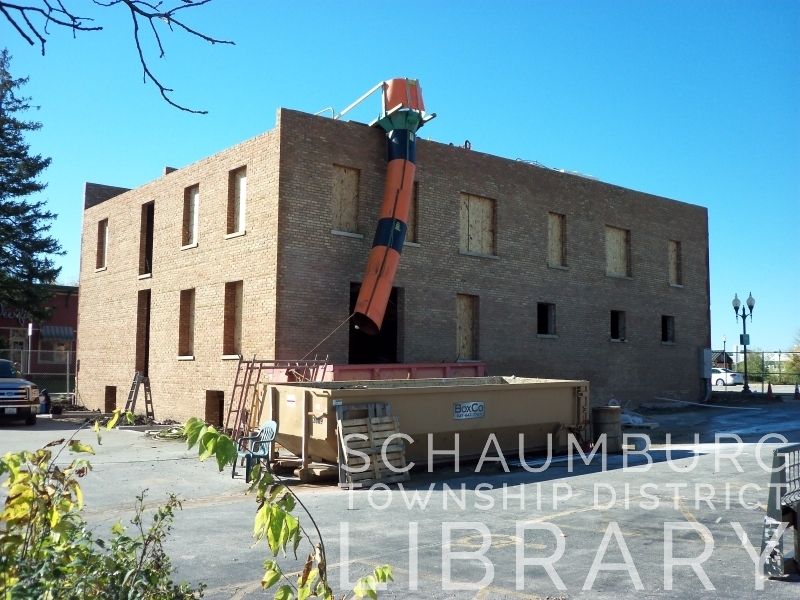 With two historical buildings on the intersection (the Schaumburg Bank building was across Schaumburg Road on the northeast corner) steps were taken to ensure that both buildings were saved. And Mr. Nebel’s response in the November 23, 1978 Daily Herald? “Shoot, I couldn’t have torn this place down. 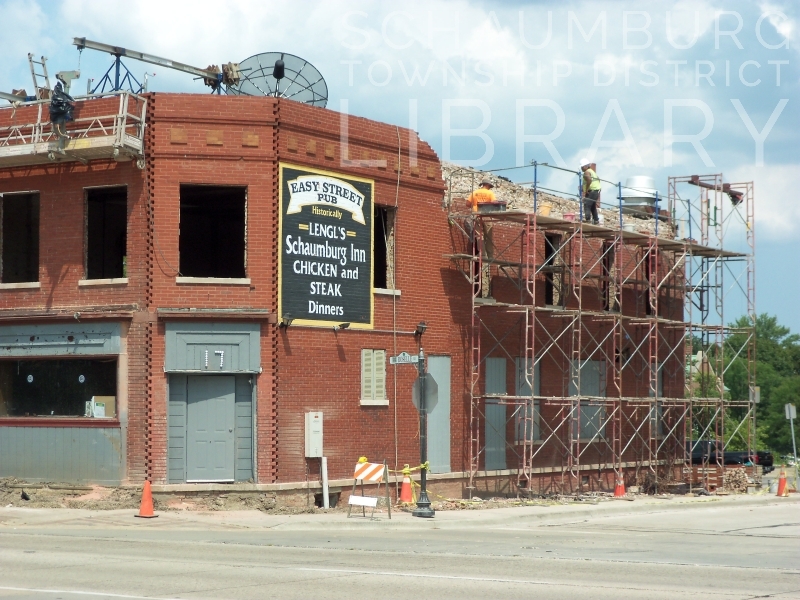 I guess it will prove worth the trouble in the long run.” It WAS worth the trouble because, for the next seven years, the Schaumrose Inn remained a mainstay until the Malnati’s Pizza chain recognized the value of the corner and came calling. On October 22, 1985, Lou Malnati’s opened their 5th restaurant on the corner of the intersection that has been going strong since the nineteenth century. They soon added on a glassed, closed-in porch that circles the north and west sides of the building and, in 2010, after 25 years, they did a little trade with the village. 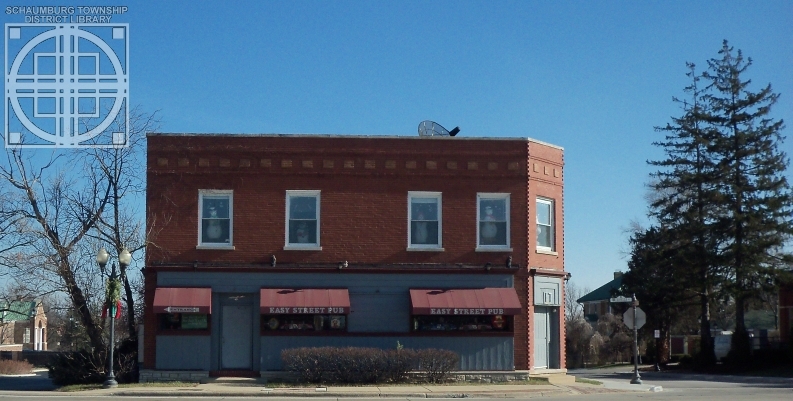 Malnati’s gave the village ownership of the Turret House and, in exchange, the village deeded the small furniture store directly to the south on Roselle Road to Lou Malnati’s. It is the light blue building in the photo below. The pizza restaurant tore down the furniture store and replaced it with a new kitchen. They also created a new waiting space, washrooms and ramp outside. In the intervening years, parking has also expanded, giving diners much greater ease in finding a spot. 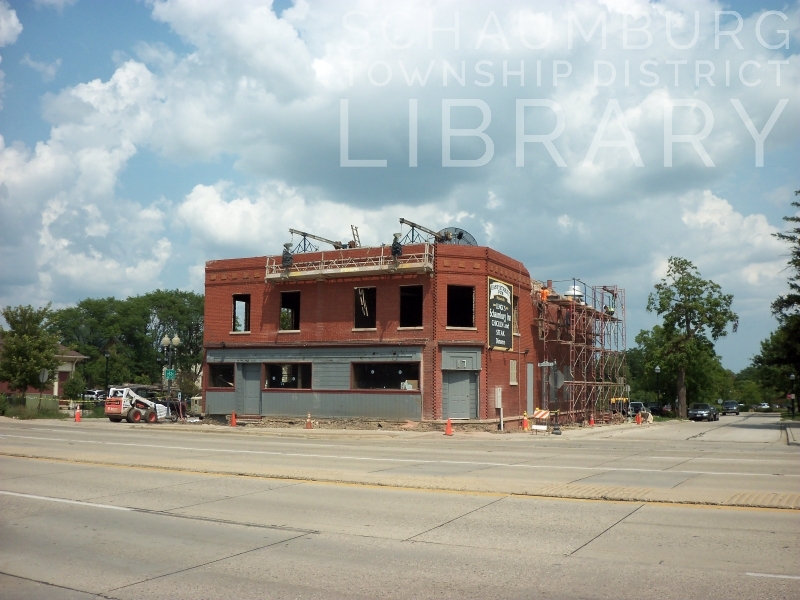 Despite the fact that it appears a title search is about the only way we can determine the year this building was built, we do know that it has definitely withstood the test of time at the busy corner of Schaumburg and Roselle Road. 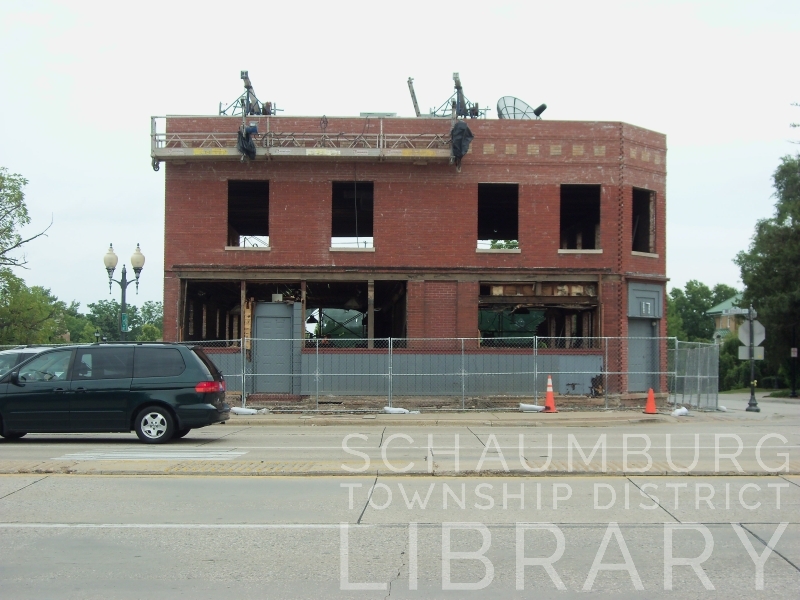 Both the Schaumburg Bank on the northeast corner, and the Fenz store on the southwest corner that were its longtime cohorts during the rural period of Schaumburg Township, eventually burned down. The bank’s spot is now a small park and the Fenz Store’s spot is now the village’s Veterans’ Memorial. Whether you know the building as Lou’s, the Schaumrose Inn, Nieman’s, Schnute’s Old Kentucky Tavern or any of the other names, we can indeed speak well of the endurance of this unique building. 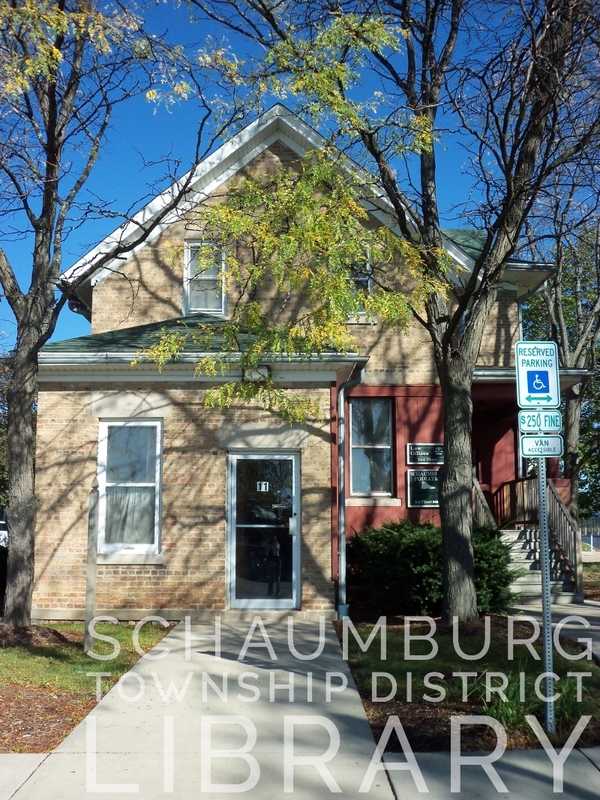 It is perfect confirmation that location is everything at the heart of Schaumburg Township. If you look at the Yelp reviews for Lou Malnati’s in Schaumburg, one of the things you’ll notice is that many people believe the building is an old house that was, at some time, remodeled into a business. Given that the early history of this building is unknown, it’s possible that it did start its life as a house, but it’s doubtful. The location is just too good. 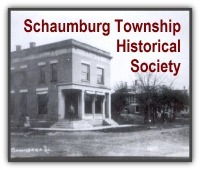 The intersection of Schaumburg and Roselle was the heart and soul of Schaumburg Township during the rural period. It’s where the farmers came to do business in the sparsely populated area. There was, at various times, within easy walking distance of the intersection, a general store, a hardware store, a blacksmith, a bank, a garage, a grain mill, a creamery and a hotel/tavern. 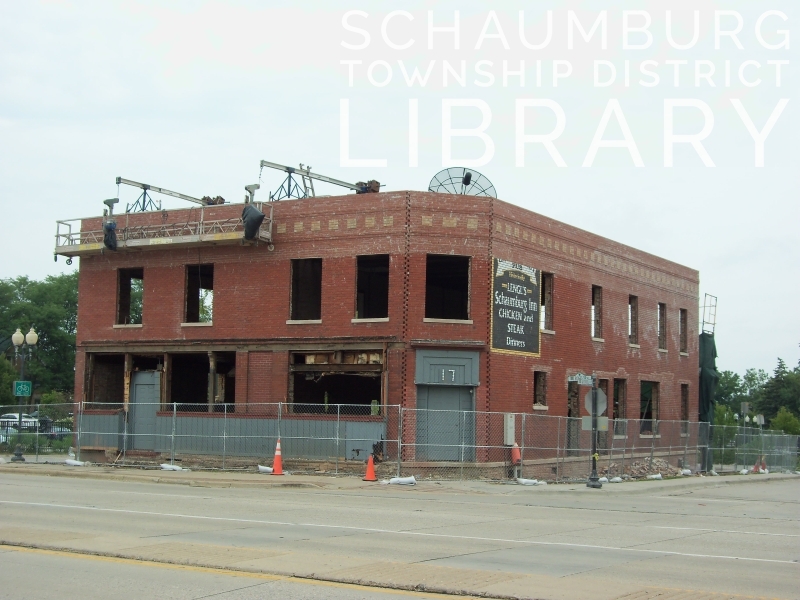 While we do not know the exact year that the building was erected, the best guess we have is from the Schaumburg Township portion of the 1875 Van Vechten and Snyder’s Real Estate Map of Cook & DuPage Counties. The map shows a building directly on the corner of the intersection. Given that other buildings around it are listed as a wagon shop, blacksmith and school, it was obviously a commercial corner. Taking a look at the same map for 1870, there is nothing on the corner. So, somewhere between 1870 and 1875, the building could have been built. Interestingly, Wayne Nebel, the longtime owner of the building during the 1960s, 70s and 80s stated in a Daily Herald article from January 1, 1975, “As near as we’ve been able to tell, it’s about 90 years old.” This would mean it was built around 1885. Given the fact that Mr. Nebel came from the German farming contingent, he might have gotten his facts from some of the locals who knew of the building either personally or from their ancestors. So, maybe his judgement is correct. 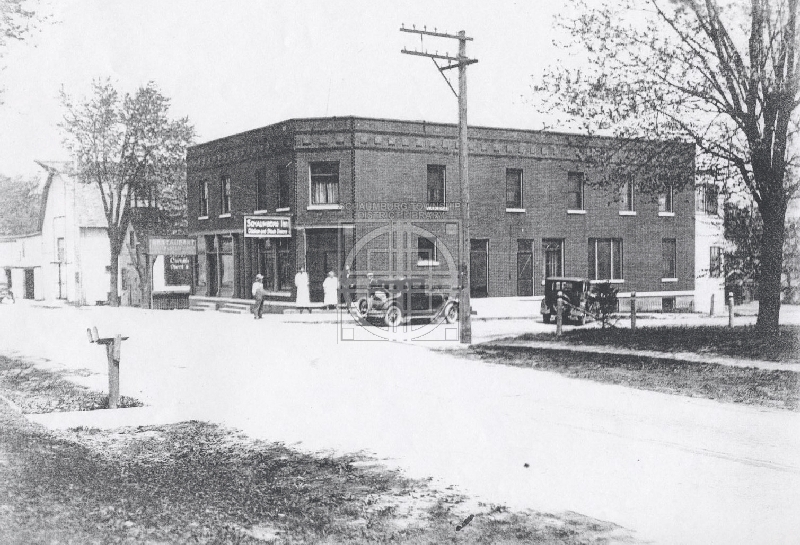 That being stated, the next time we find any mention of the building is in a 1901 article from the Daily Herald. 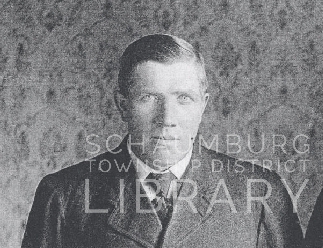 This article mentions that on June 25, H.C. Hattendorf or Herman C., would be turning over his hotel and saloon to Henry Quindel (pictured below.) I also discovered that Hattendorf is mentioned in the 1900 census as a “saloon keeper.” His age at the time was 26 so we know he hadn’t held the job and/or owned the building for long–and that someone definitely came before him. This wonderful description gives us a glimpse at the building’s interior and what it was used for at the turn of the century. If you look at the photo above from 1913, the glass front looks like it was actually part of the front door. Also, it is my understanding that the ball room was on the second floor, separated from the commercial end of things. Imagine carrying all of that tin to the second floor to work on. I suspect, too, that the framed portion on the north side of the building possibly slid aside or dropped down to allow access for merchandise to be brought into the building. The railroad that is mentioned never materialized, though there were many discussions of it in the paper. It was obviously designed to connect the Union Pacific Railroad in Wheaton to the Union Pacific line in Roselle to the Chicago and North Western Railroad in Palatine. Other potential north/south lines were also proposed at one time or another but the Elgin, Joliet & Eastern was the only one built, even though it was much further west. 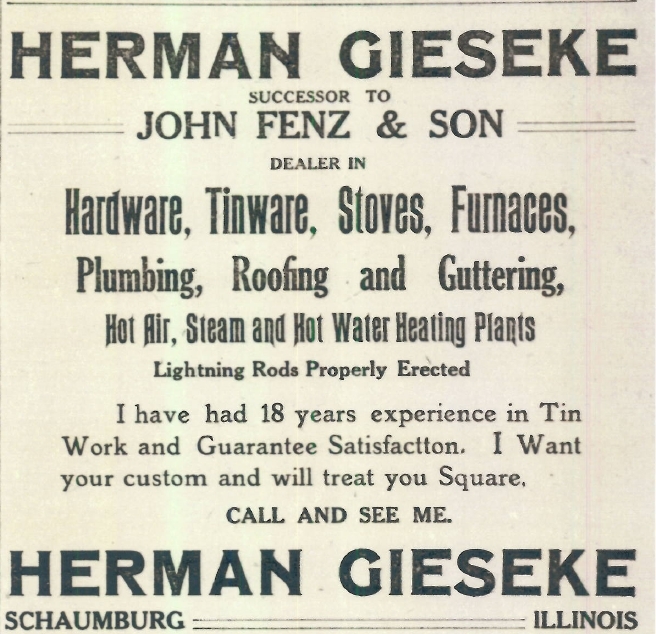 This ad appeared in 1909 and, clearly, the Fenz family had sold the store to their tinsmith, Herman Gieseke. In fact, in a 1911 article, the store is mentioned as H. J. Gieseke’s Hardware Store. 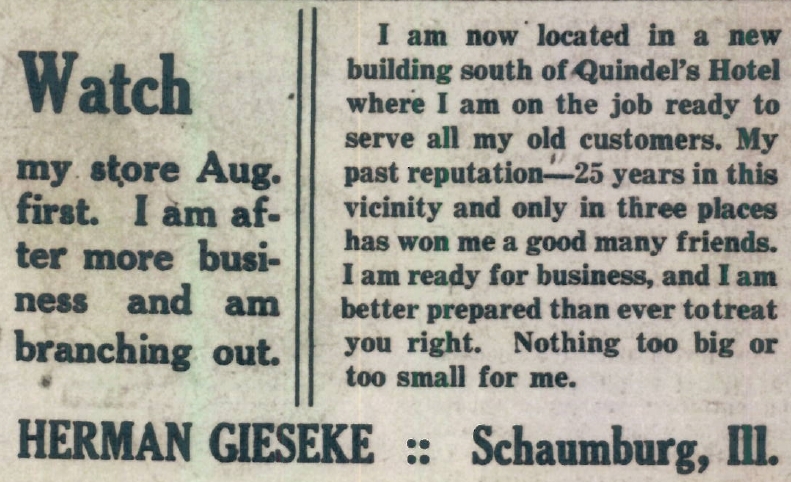 This ad from July 25, 1913 throws a bit of a wrinkle into the mix, letting us know that Mr. Gieseke relocated to a new building. Unfortunately, not only am I unsure which building it was but, a year later, in the September 18, 1914 paper, it was reported that “H.J. Gieseke’s hardware and grocery store” burned. A few years passed with no mention of who was occupying the building on the corner. The next tidbit appears in the November 14, 1919 issue of the paper where it mentions that the “first social hop of the season will be given at Freise’s Hall, Schaumburg.” Yet another mention in the May 14, 1920 paper advertises another social hop at the same place. Both record Ed. Diekman as the manager. Curiously, Mr. Diekman’s profession in the 1920 census is listed as merchant of a cigar store. We can only assume he was operating a cigar business in the old hardware store as we know, for sure, that the Fenz store on the southwest corner of the intersection and Lengl’s tavern were definitely occupied. The next time we meet him is in the October 17, 1924 paper that mentions “E.H. Diekman is getting lined up to start a general store in the former hardware store.” So, we presume he was expanding his cigar business and, in fact, a later article in early 1925 says, “One of those good old time programs will be given Saturday evening Feb. 16th in the Diekman hall above the Schaumburg store…” It didn’t last long because, by November 20 of the same year, it is reported that he had discontinued his business. In the year 2000, appropriately enough, outer space came to Woodfield Mall and it came in the form of a new restaurant called Mars 2112. The eatery inherited the space that was originally used for the Woodfield Ice Arena and later Woodfield Mall Cinemas. Called “Disneyland with dining” by the owner, Pascal Phelan, Mars 2112 first opened in Times Square in Manhattan as a standalone location. Woodfield Mall was chosen as its first shopping center location and it officially opened on October 3 after an $8.5 million startup investment. The name of the restaurant was based on the year 2112 when it was believed that commercial flights would take passengers to Mars. The interior decor reflected this Mars theme and came complete with giant videos showing customers the terrain of the red planet. Lava pools, Martian creatures and a shuttle ride for 32 guests that operated between the entrance and the dining room were also part of the experience. The shuttle ride, which was actually a 747 flight simulator used to train pilots, rocked and swayed as if the passengers were on a trip to Mars. The “voyage” lasted 3 1/2 minutes. When you got to the dining room, even the walls were red and cratered. 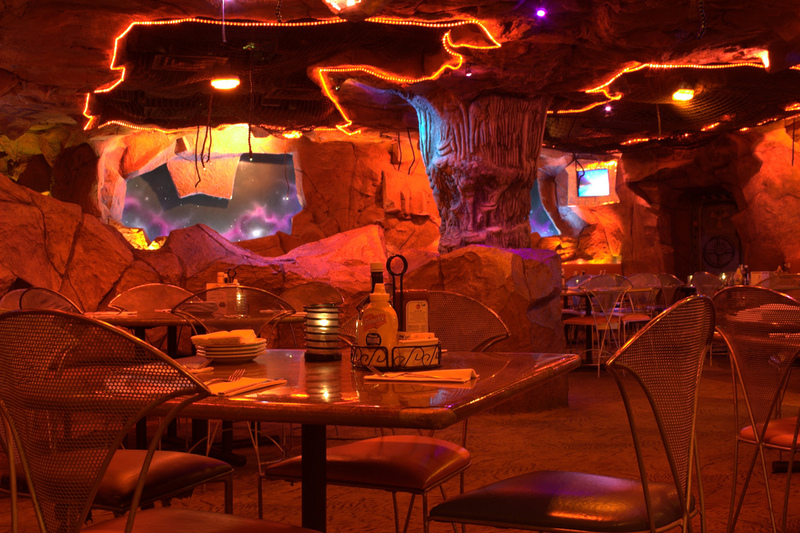 The whole theme was meant to feel as if you were eating on Mars. And the food? It was upscale, but casual, and ranged from burgers to grilled salmon to ribs, pasta and steaks. In fact, Pascal Phelan, the owner hired a top chef from France to put together the menu as a fusion of American and international cuisine. There was no reason given for the abrupt closure of Mars 2112 but, while it lasted, it made a dramatic impact on the Woodfield restaurant scene. Eating a hamburger and fries on Mars? Who wouldn’t want to give that a try? This blog posting was written with the help of Daily Herald articles from February 12 and September 28, 2000 and June 12 and November 8, 2001. An October 2000 article from the Chicago Tribune was also used. While driving down Roselle Road recently I couldn’t help but notice that there were a number of dumpsters outside of the Denny’s in Hoffman Plaza. 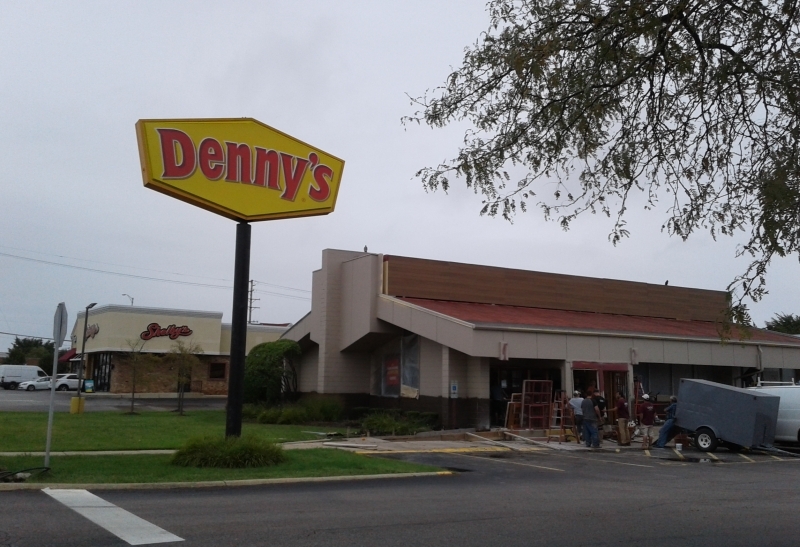 The next day I stopped to find out if there was a major renovation going on or if they were tearing down this local landmark. Fortunately, it was the beginning of an update, complete with new windows and front facade, booths, tables and other interior upgrades. Hoffman Plaza had opened in the summer of 1959 and was a welcome addition to all of the early residents of the township. Fast forward fourteen years. The shopping center added even more to the local, commercial arena with the relocation of Jewel from its original spot facing Higgins Road to where you see it today on Roselle Road. That big opening happened on April 14, 1973. 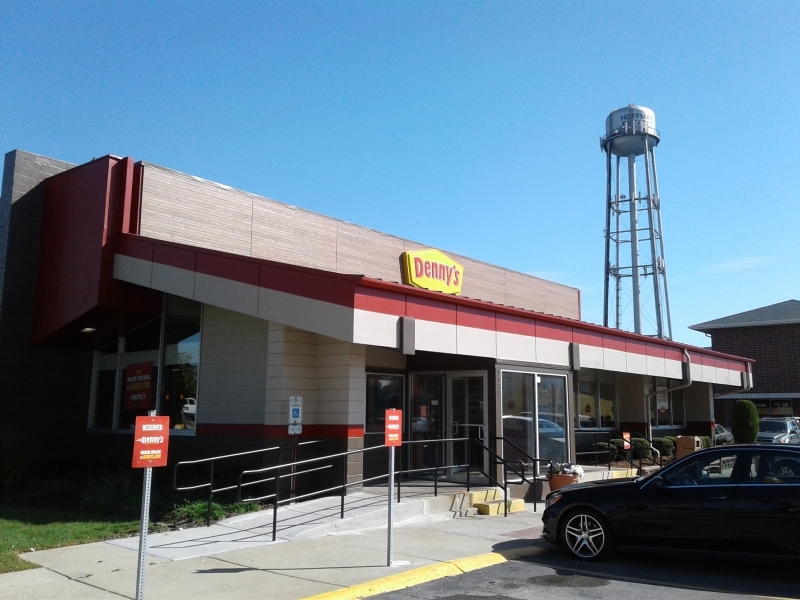 A few months later, in the summer of 1973, Denny’s opened its doors in Hoffman Plaza, attracting more diners and shoppers to the shopping center. They joined Wille’s, Snyders Drug, Case ‘n Bottle, Acorn Tire, the Post Office and many others. Today, you can see the results of the refreshed facade. And you can still find the Grand Slam breakfast on the menu. P.S. 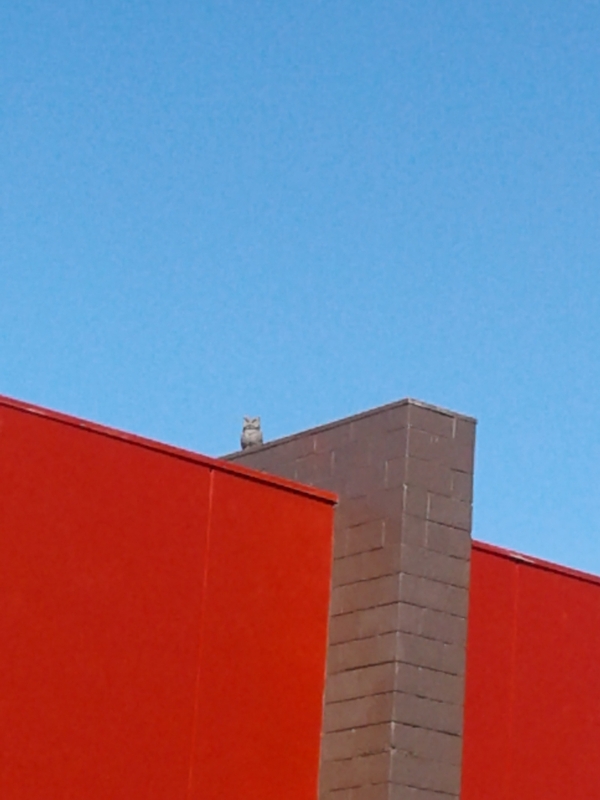 The next time you’re there, take note of the stone hawk and owl on the top of the building. 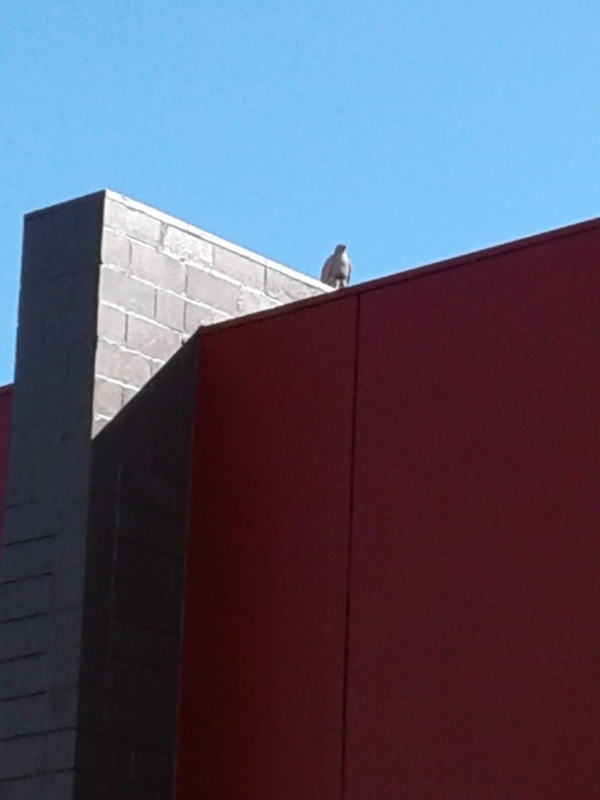 This is a common practice to keep pigeons away from buildings. 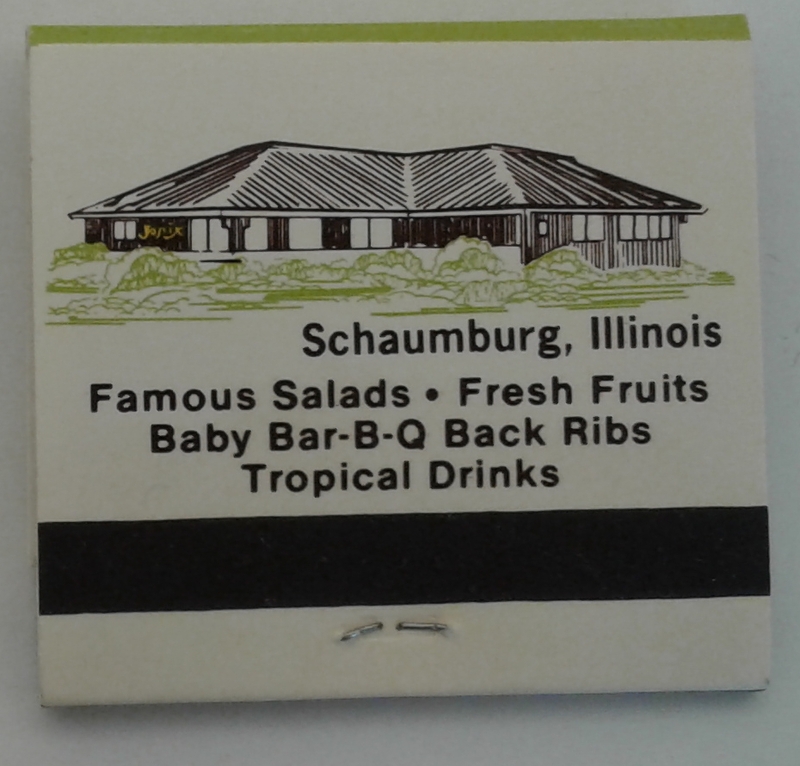 A while back local realtor Bob Dohn passed on a bag of matchbooks that he had collected from various restaurants of Schaumburg. 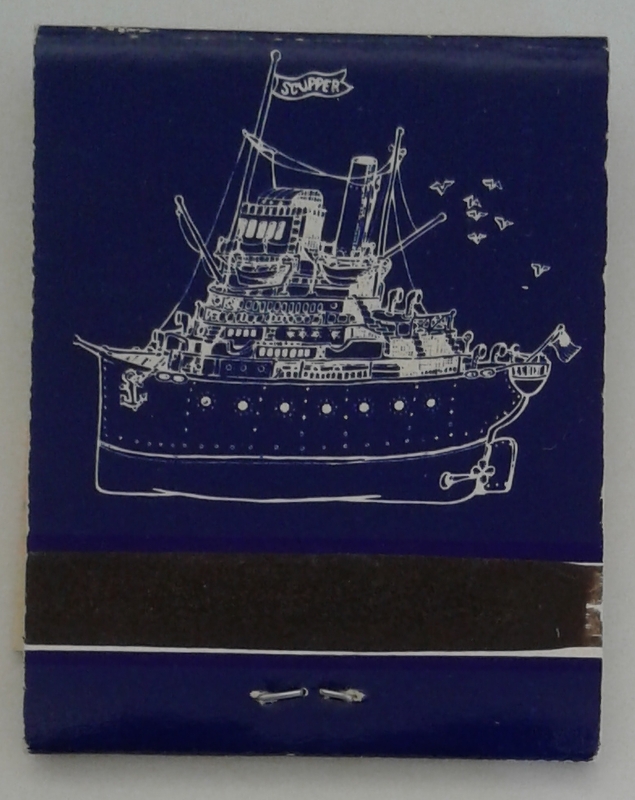 Matchbooks were a popular advertising gratuity for many businesses and can give us a peak at what the business may have looked like, the color and style scheme of the restaurant and the food they might have been known for. 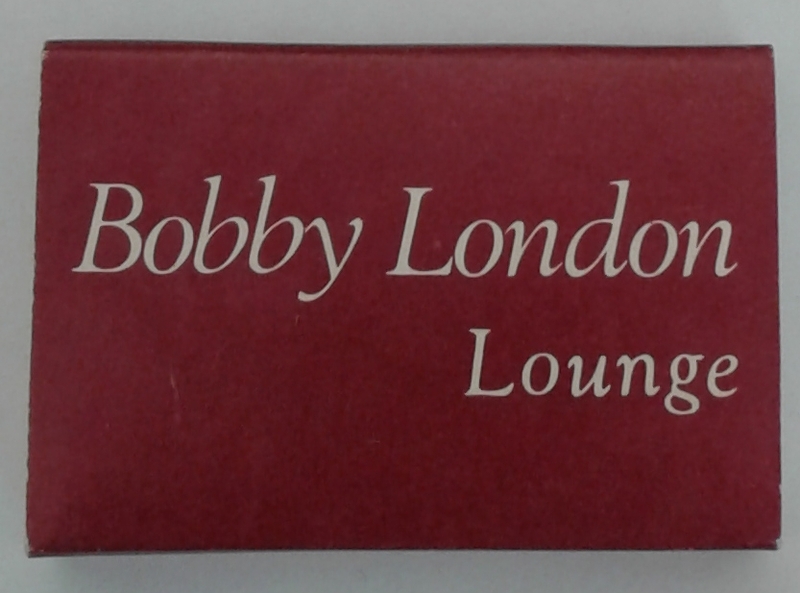 I’ve featured other local businesses on matchbooks before. You can read those blog postings here and here. These restaurants are gone but some of them may trigger some good memories. Please feel free to share those memories in the comments below. 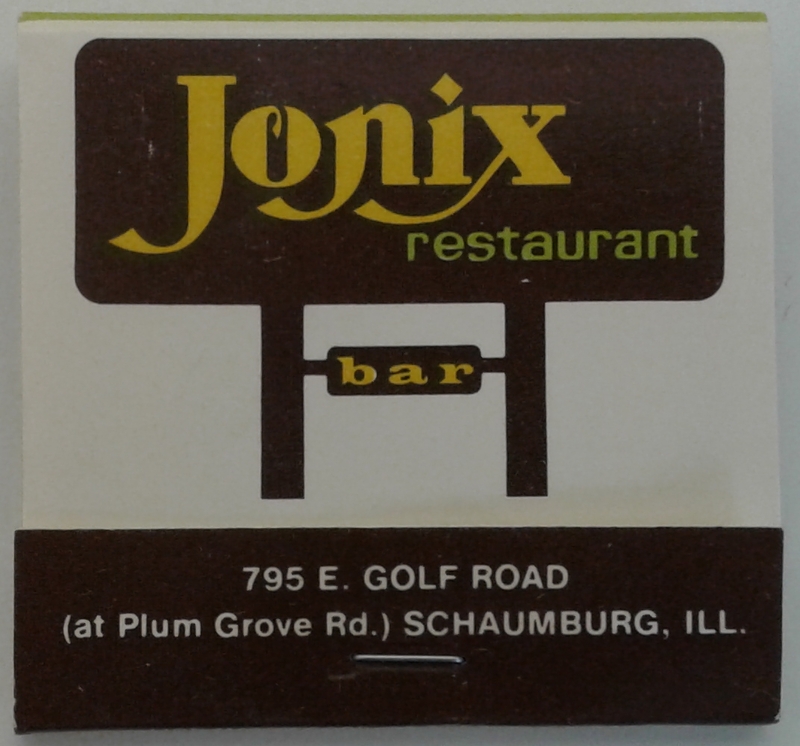 Jonix opened in 1979 and was the first restaurant to be located on the southwest corner of Golf and Plum Grove Road. They specialized in all of the things noted on the matchbook and, in 1983, segued into the popular Copperfields. At the time, these types of bars/restaurants were commonly called “fern bars” because of the wealth of ferns and other greenery that were placed throughout the business as well as the wood, brass and fake Tiffany lamps that were also part of the decor. 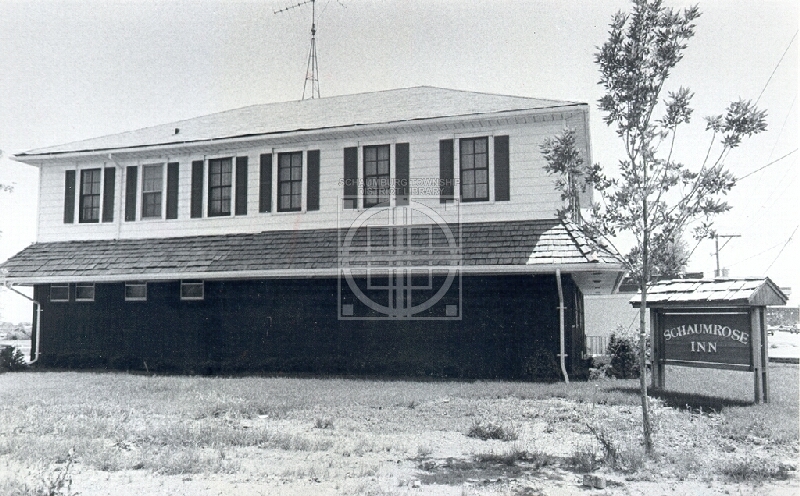 The outline of the building as seen on the matchbook is still evident in the building today. 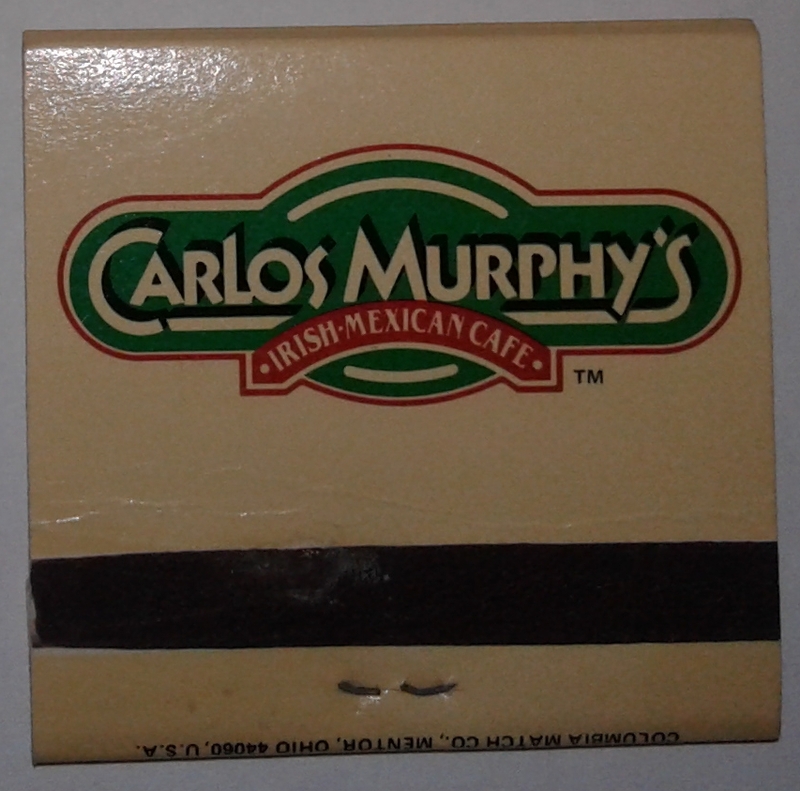 Carlos Murphy’s was another hot spot and another “fern bar” on Golf Road. 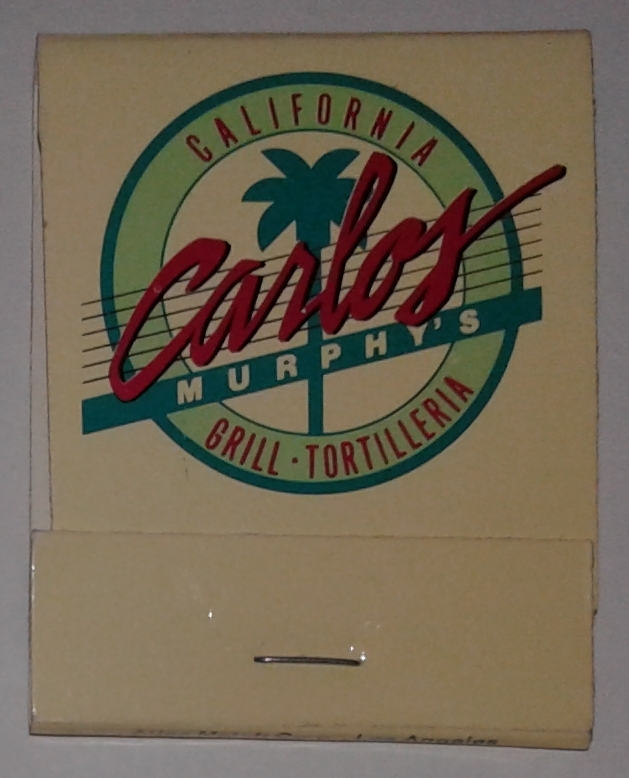 It opened around 1984 and originally featured a Mexican and Irish menu as can be seen on the top matchbook. After a number of changes they began offering everything from Mexican to Italian to Asian with American dishes like ribs, chicken and gooey desserts sprinkled in between. It eventually became a grill and tortilleria which is a tortilla bakery. They closed around 2001 and you can now find Bahama Breeze in the location. 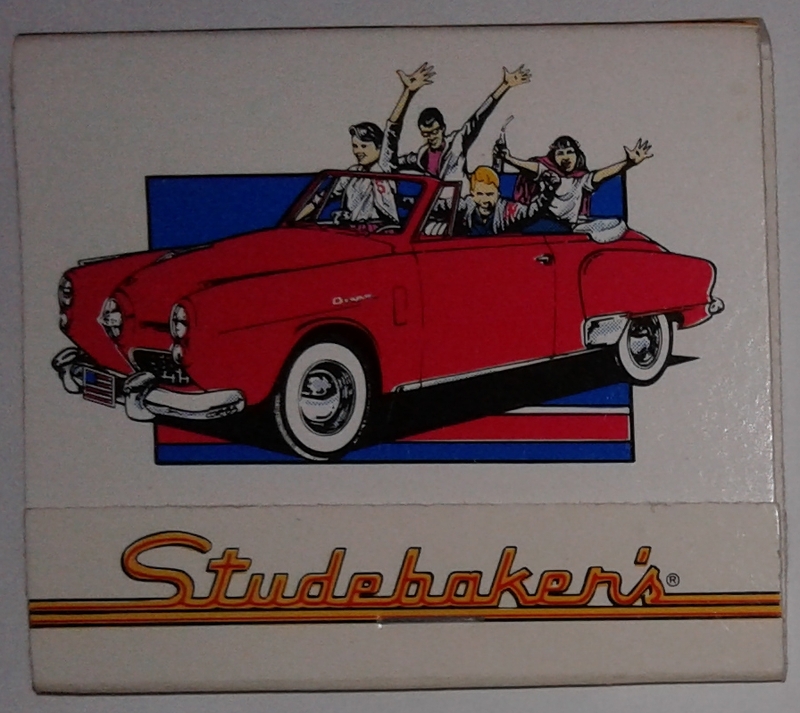 And then there was Studebakers. It was THE dancing nightspot where you could see and be seen. The 50’s/60’s bar and restaurant was located in the Woodfield Commons shopping center at the southwest corner of Golf and Meacham Roads. It opened in September 1983 as a concept restaurant by the Alabama-based Studebaker’s Inc restaurant chain and Chicago Bears running back Walter Payton. They were in business until 1997 or 1998. Walter Payton took on another new venture when he opened Thirty-fours in 1988. It was located near the Hyatt on Golf Road and was also both a restaurant and a nightclub. According to the 1990-91 phone book, they had a dinner buffet, ladies night and were available for corporate luncheons. Interestingly enough, the required entry age was 23 and there was a dress code. The club stayed in business until 1995. 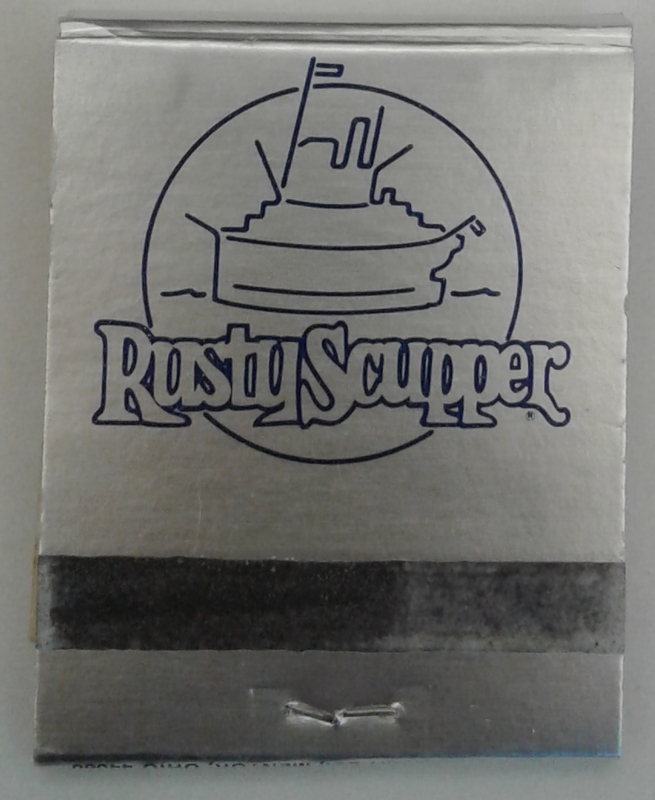 Another long time popular spot along Golf Road, close to Route 53, was the Rusty Scupper. Amazingly enough, it opened back in 1978! It also began life as a fern bar–only with a nautical theme–and had a menu that was largely surf and turf. Their tenure ran out in December of 1989. Monday’s Restaurant continues the chain of restaurants on Golf Road that we have uncovered. Located on the site of today’s TGI Friday’s near Woodfield, Monday’s appears to have opened in 1978 and been somewhat of a fern bar too. To set themselves apart, their decor included “oriental panels, leaded glass, Egyptian tapestry, East Indian statues, round hearths and an original open air fireplace.” (Daily Herald; July 27, 1979) They were known for their famous buffet brunch on Sundays as well as their salad bar and desserts. Business appears to have ceased around 1982 when their newspaper classified ads ceased. The Marriott Hotel on Martingale Road featured these two venues, beginning in the late 1980’s. 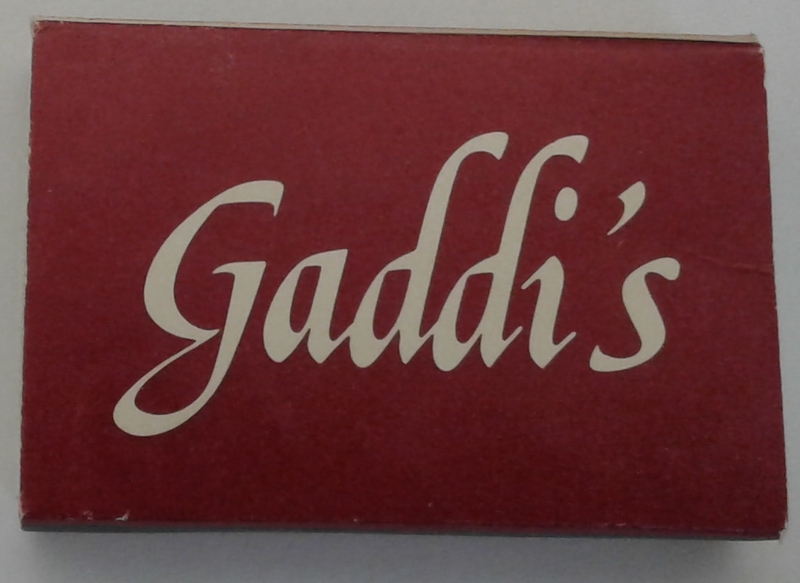 Gaddis was their AAA Four Diamond restaurant and they featured fine dining with continental dome service followed by dancing in the Bobby London Lounge. They advertised themselves in the Daily Herald as “one of the Northwest suburb’s most romantic restaurants, where the emphasis is on fine food prepared tableside…” (Daily Herald; April 21, 1995) They appeared to have stayed in business into, possibly, the early 2000’s. If anyone has more details on these restaurants that I can add or change, please don’t hesitate to comment below or send me an email. I’d like to get the history correct! It’s always interesting that we drive past a building for years and never take as much notice as we should. For instance, this was the Easy Street before the recent renovations began. Then, one day after work began on the building, I took a good, long look at this view. Wow. The brick is completely different on the north face of the building. 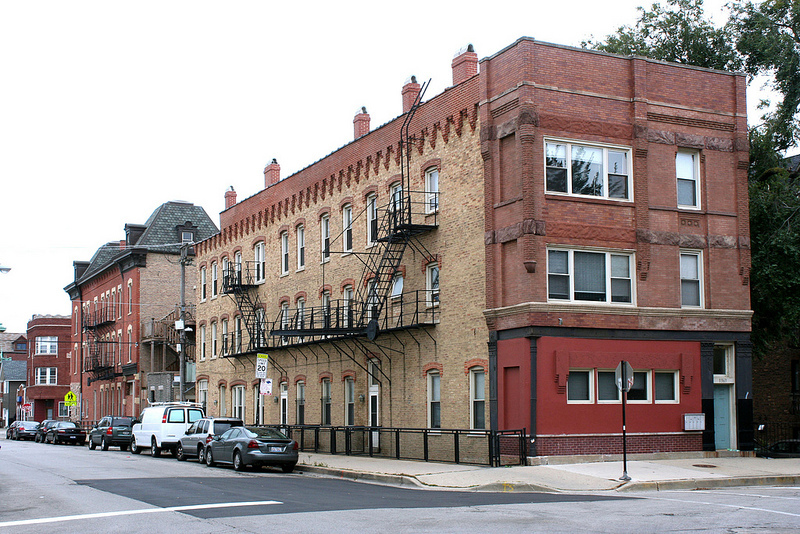 It’s a yellowish, tan brick while the west and south facades are an actual red brick. And, what about the east facade? Well, it looked like this before the renovation. On closer examination, it was obvious this side had been painted at some point in time. But, what color was beneath that brick red paint? As this facade was prepared for tuckpointing, it was determined that the brick was in severe disrepair–to the point that it crumbled very easily. Also discovered was that the brick was not uniform but was an amalgamation of the two different types of brick that made up the building. This brick discrepancy, and the 1976 fire that damaged the building, must have been reason enough for the previous owners to paint over the bricks. But, the bigger question is why was this building originally constructed with two different types and color of bricks? Having never really noticed buildings with varying brick types, I looked around and noticed that there was another building in Schaumburg that had the same dual brick scheme. And it wasn’t far away. This house is commonly known as the Quindel house and is adjacent to Lou Malnati’s on East Schaumburg Road. You can see the red brick to the left that is on the front/north facade and the yellowish brick that covers the rest of the building. Besides the bricks, the thing that links these two buildings, is the name Quindel. H.E. 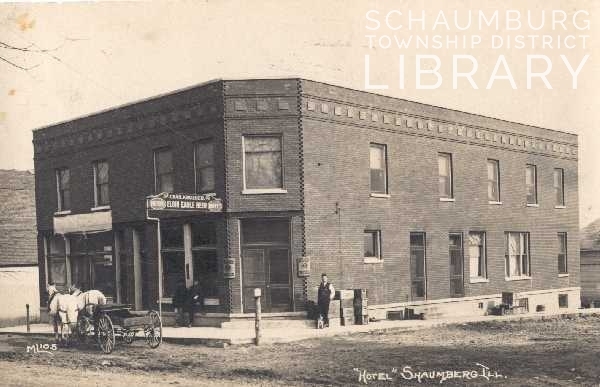 Quindel built both his home on Schaumburg Road that is now an office building, and the tavern/hotel that we know today as the Easy Street. 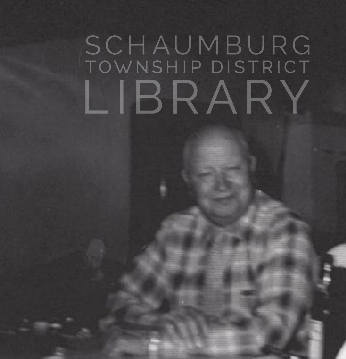 Mr. Quindel was quite the mover and shaker in Schaumburg Township in the early 1900s and always had a number of schemes in the works. The home was constructed around 1909 and was built for his wife Caroline and their four sons, Frank, Emil, Arthur, and Alfred. The Easy Street was built in 1911 and was operated by Charles Krueger. I still wanted to confirm that price was probably the reason for the two different color of bricks so I put the question out on a listserv. Fortunately, Neil Gale with the Digital Research Library of Illinois History Journal, confirmed my supposition. The yellow brick is called Chicago Common Brick and was a less expensive brick that was used on the sides and backs of apartment buildings and larger buildings in Chicago where price was an issue. Note this photo from his blog posting on that topic. It looks familiar, doesn’t it–and it verifies my suspicions. When renovations and reconstructions happen, not only do we get the wonderful finished result, but we also get to see what is uncovered along the way. The Easy Street truly is its own little archaeological dig. Thank you to Neil Gale for helping me to confirm the rationale behind the two styles of brick! 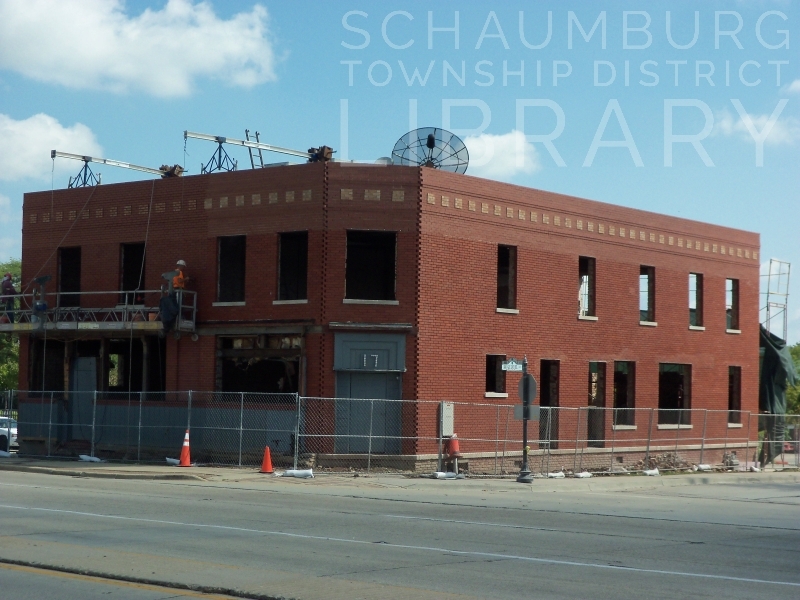 If you’ve been driving down Roselle Road near the Schaumburg Road intersection, you have probably noticed there’s something going on with the former Easy Street Pub at 17 Roselle Road. These photos were taken on August 2, 2017 shortly after work began at the end of July. You’ll notice the windows have been completely removed but the doors are still intact as well as the gray siding. It also appears they are doing extensive brick work on the south side of the building. 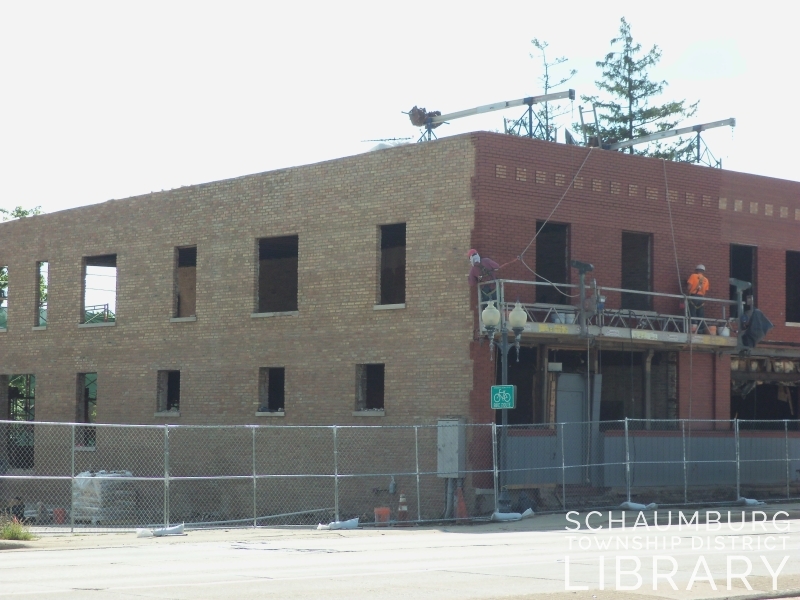 The scaffolding has been removed on the south side where the brick work was being done at the top of the building. In comparing photos, we can tell that the restructured brick was restored to its original look. It’s interesting, too, that the two tall doors on the south side that had been boarded up for years have been removed. It is also possible to see clear through the structure. We can see that the building has been taken down to its studs. It’s starting to come together, isn’t it? The brick definitely looks refreshed, although the gray siding and gray painted front door still remain. For comparison’s sake, let’s look at the earliest rendition of the building. This 1913 postcard shows the structure shortly after it was built by H. E. Quindel in 1911 and after Charles Krueger began leasing it as a tavern/hotel. Notice the large windows in the front and the multiple doors on both visible sides of the building. Not only can we see the two doors on the diagonal but there are also two doors on the south side as well as two doors in the middle of the front facade. Below is a photo of the building from the 1920s when it was called the Schaumburg Inn. It still has the same look although it is interesting to note the steps that have been added to the front. Clearly the road was graded and paved sometime between the two photos. 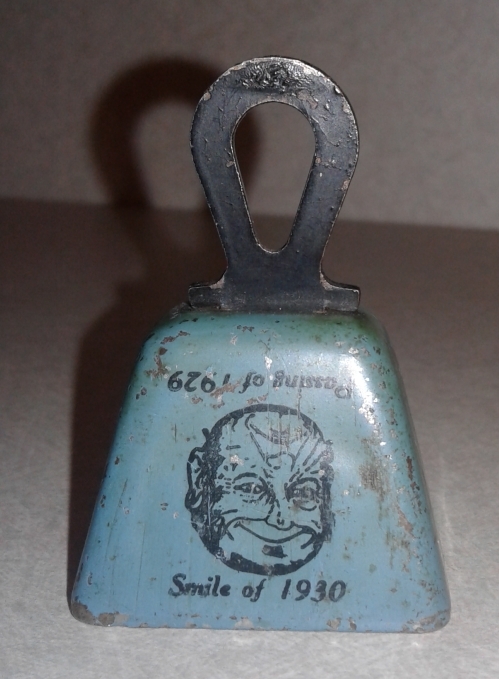 At this time Frank Lengl was the owner and was at the beginning of his 50 some-odd-year-tenure. However, he had yet to paint the sign on the side of the building that advertised his chicken and steak dinners. It will be interesting to watch as the final renovations emerge–both inside and out. 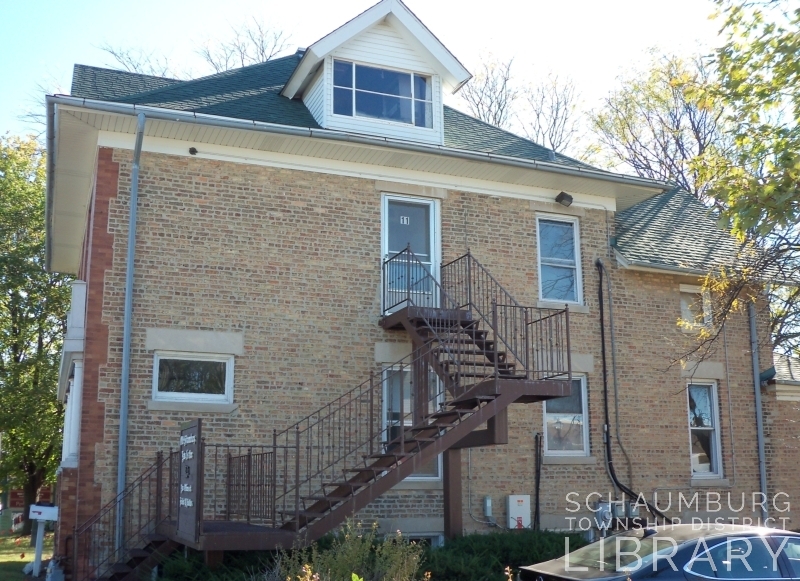 This historic building is a Contributing Structure in the village’s Olde Schaumburg Centre Historic District. 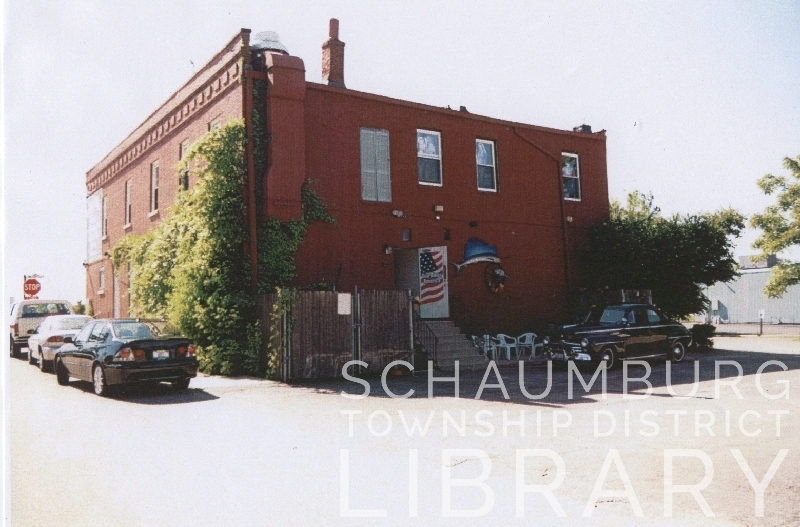 It’s wonderful to see that it remains an integral part of the heart of Schaumburg Township. CAN YOU HELP WITH THIS RESTAURANT? One of the readers of the blog posed a question this week asking about a restaurant his family frequented while he was growing up in Schaumburg Township. This would have been in the 1980s or 1990s and, according to the reader, the restaurant was in the same location as the former La Magdalena which was at 216 W. Golf Road. This is location of the current Ziegler Maserati dealership at the corner of Golf Road and Valley Lake Drive. According to the reader, the restaurant served great burgers and steaks and, as a unique feature, showed silent, black and white movies in a back room. None of these rang a bell with the reader–or fit the bill as far as the menu was concerned. I also suggested Ground Round as a possibility because their restaurants typically used the black and white movies as a gimmick. The first Ground Round in Schaumburg was located on the west side of Roselle Road, between Higgins and Golf. [Thank you to the commenters below for this tidbit.] The second Ground Round was at 800 E. Golf Road on the northeast corner of Plum Grove and Golf and it closed sometime in late 1989 or early 1990. 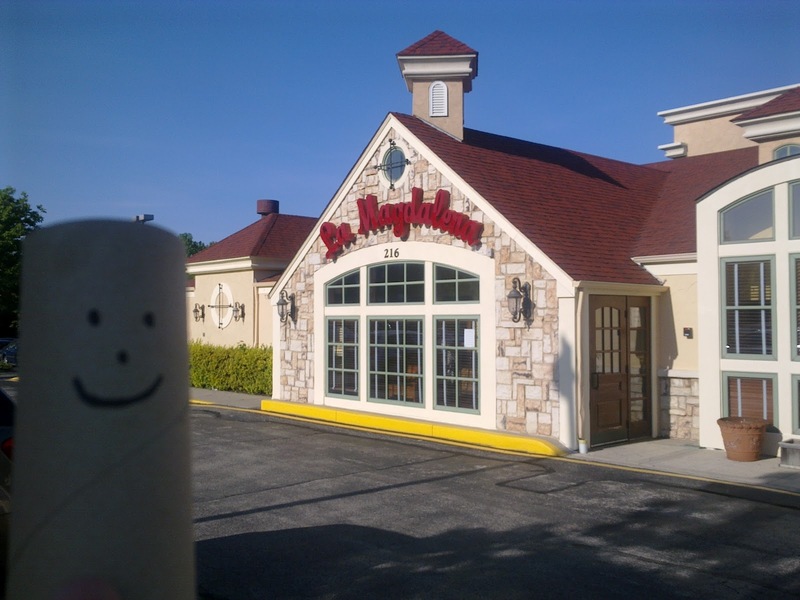 The reader did not think these were the restaurant or the location. Does this ring a bell with any of you readers? What are we missing? If you have a suggestion, please make a comment or send me a quick email. Both the reader and I would appreciate it. Thank you! After reading the many comments below–and some that were sent to my email that duplicate the comments–the reader who posed the question thinks it probably has to be the Ground Round. He definitely remembers the food and the movies and Ground Round is closest to that description. Many thanks to those of you who contributed. It is always nice to be able to appeal to the greater blog brain! In the new biopic The Founder, there is a mention of Ray Kroc opening his first McDonald’s restaurants in the Chicago area. One of the restaurants is the first one at 400 Lee Street in Des Plaines. This original location opened in April 1955 and the building has since been torn down and rebuilt. But the movie also mentions other locations in Waukegan–and Schaumburg! Curious about this connection, a patron emailed me about the beginnings of McDonald’s in Schaumburg Township, wondering if we were, in fact, one of the first locations in the Chicagoland area. After doing a bit of research, I discovered that there were others in the area that opened earlier–Arlington Heights, Elk Grove Village and Wheeling–to name a few. 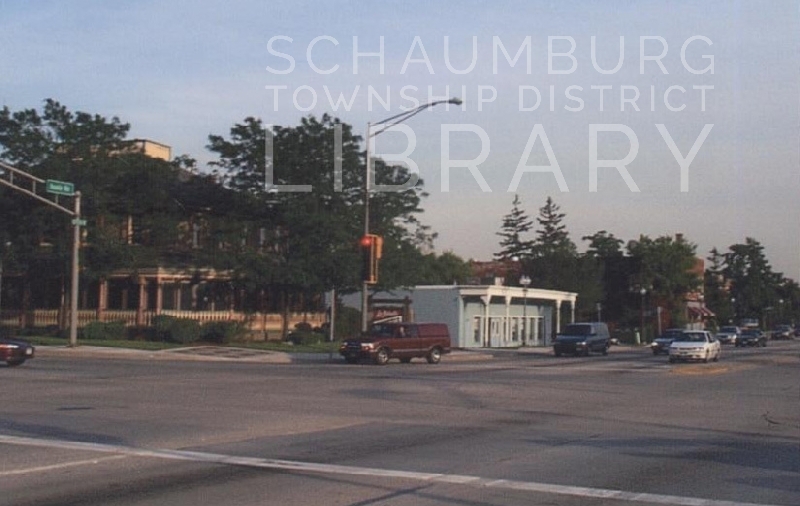 The first one in Schaumburg Township was the location on Golf Road, just east of the intersection with Higgins. 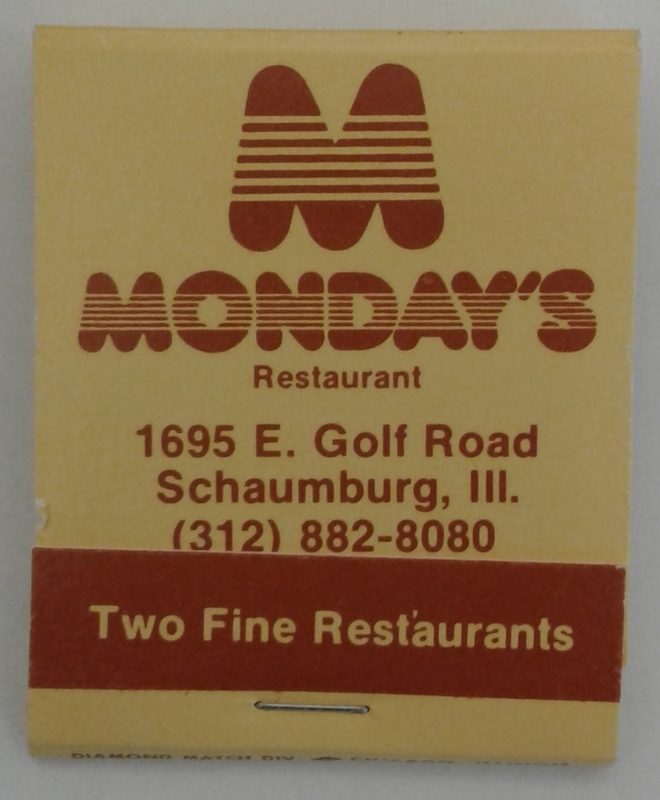 This restaurant held its grand opening on Saturday, October 17, 1970 (15 years after the Des Plaines location) when they opened to the public at 10 a.m.
Ronald McDonald was there in person to greet kids from 10 to noon and handed out free gifts. Their ad from the October 16, 1970 Daily Herald mentions their “piping-hot 100% pure-beef hamburgers, golden brown french fries… and triple-thick chocolate, vanilla and strawberry shakes.” A photo from the October 22 paper says that the grand opening drew over 4000 people! Facing Golf Road, the facade and interior of the building were in the latest style of the day which had been developed in 1968 by the corporate office. Having moved from the outdoor restaurant trend with the golden arches, the Schaumburg location featured a brick building with big windows and a mansard roof. As noted in the comments below, there was also an interior playground that was used as a space for countless birthday parties. The McDonald’s sign on Golf Road maintained the golden arches–just as they do today. As one of the commenters noted, the original building was torn down about around 2002 and the replacement building was not only smaller but was resituated on the lot to accomodate for the heavy drive thru traffic. The location had a great 46-year run but, unfortunately, closed in 2016 after a new store opened in the Golf Rose Center in Hoffman Estates. 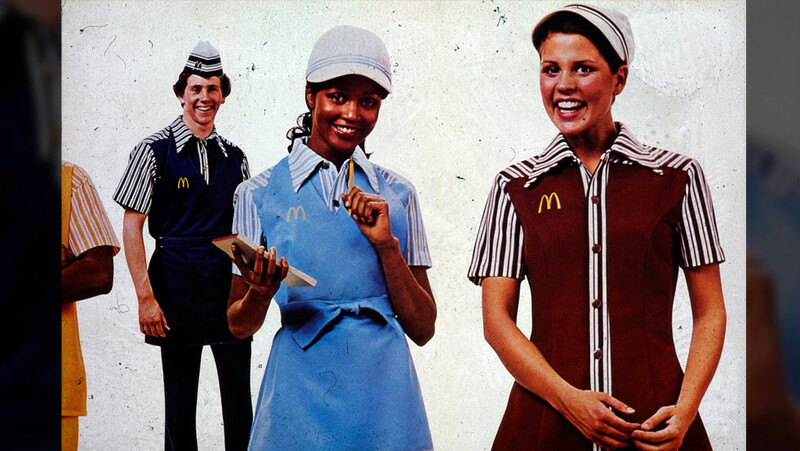 So many of us worked for McDonald’s in the 1970’s wearing those polyester uniforms with the perky hats, frying hamburgers for a Big Mac, frying eggs in a six-sectioned egg ring for Egg McMuffins and actually mixing and whipping the shakes in a triple-head milkshake maker. And let’s not forget making change in our heads at the cash register! What are your memories of the McDonald’s in Schaumburg Township? Did you work there? Do you know when they opened? What were your uniforms like? Please feel free to share your thoughts! Also, enjoy this story by Dann Gire of the Daily Herald as he discusses the appearance of the Schaumburg and other Chicagoland McDonald’s in The Founder. 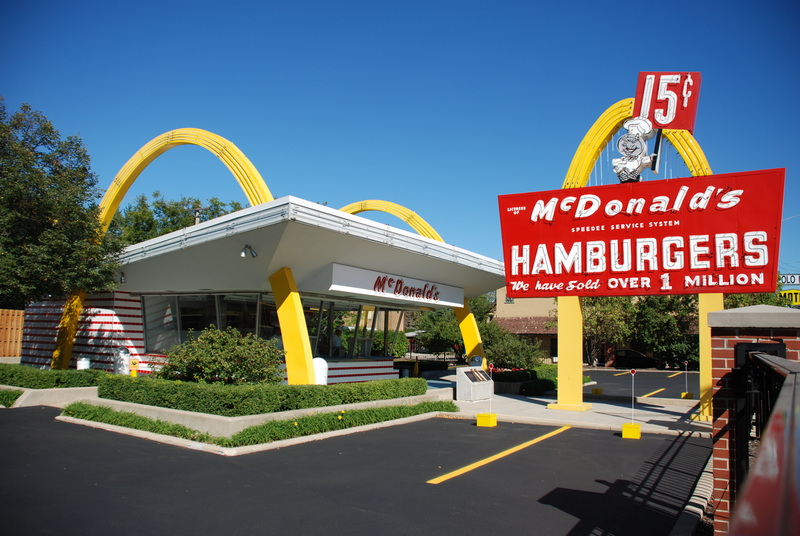 The article, “The Browning of McDonald’s,” was gratefully used in the description of the first McDonald’s in Schaumburg. TWO LOCATIONS OF CHICKEN UNLIMITED NOW SERVING UNLIMITED CHICKEN! It seems a bit of a fried chicken craze hit Schaumburg Township in the early 1970’s. 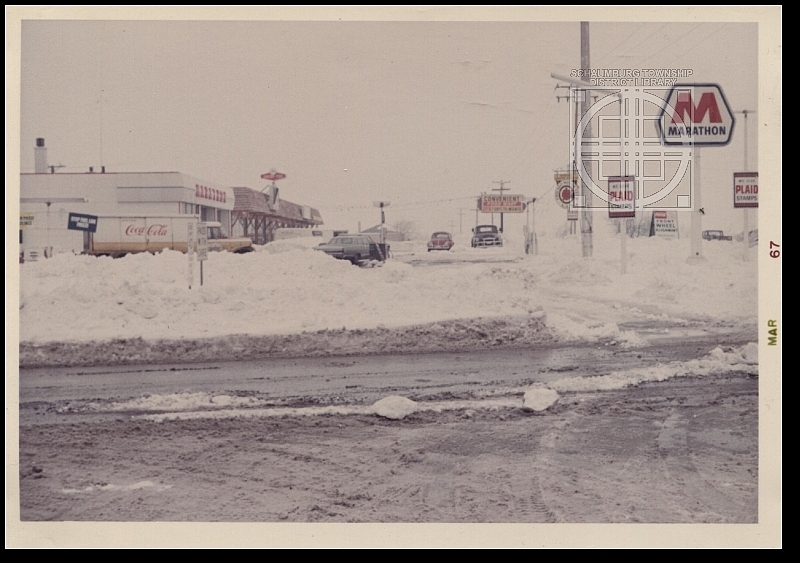 Kentucky Fried Chicken had already paved the way in Hoffman Estates in the late 1960s when they opened a brand new restaurant at Higgins and Roselle Roads. In 1970 Ray and Geri Herringer opened a Chicken Unlimited franchise at 10 N. Roselle Road. [Daily Herald, April 26, 1971] This was followed by another Chicken Unlimited franchise that opened in July 1972 on Higgins Road. In addition, Brown’s Chicken decided to join the competition with their restaurant at 620 S. Roselle Road in September. 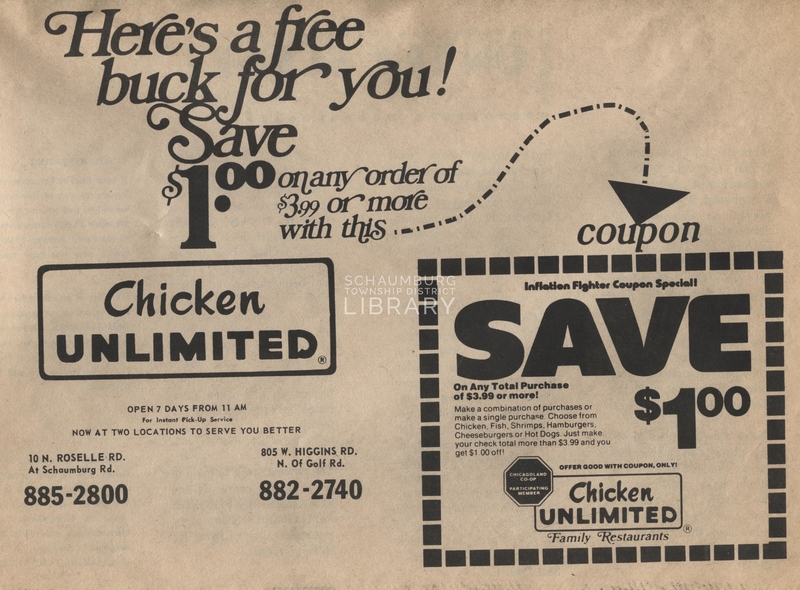 In the July 12, 1972 issue of the Daily Herald, an ad invited the public to the grand opening of Chicken Unlimited’s Schaumburg stores at 805 W. Higgins Road and at 10 N. Roselle Road. The Higgins Road store was at the intersection of Higgins and Golf and the Roselle Road store was in this small strip mall that was on the northwest side of the intersection of Schaumburg and Roselle Roads. When they came to town they brought not only “the world’s best fried chicken” but fish & chips, giant Whamburgers, fried shrimp and hot apple puffs. Yum! And, to celebrate the opening of the stores, they offered a “Get Acquainted Coupon” that featured 12 pieces of light, crispy chicken, french fries, cole slaw, hot rolls and honey. All for the low price of $3.99. Certainly enough to feed a family of five or six! The Herringers also offered a package deal for catering purposes. It was called “Parties Unlimited” and featured a package of chicken, salad, rolls, plates, knives and forks. Yet another ad from a November 1973 mailer stated that the stores were open 7 days a week, beginning at 11 a.m. It also featured this coupon for a fast way to save a buck. Unfortunately, though, Chicken Unlimited did not last long. On March 30, 1976, the franchise filed for bankruptcy and it was around this time that the restaurants shut down in Schaumburg. The last time there was an appearance in the Daily Herald for one of the Schaumburg locations was in 1976, although ads for the Palatine and Elk Grove locations appeared into the later 70’s. Maybe one of our readers worked at one of the restaurants or remembers when they closed? If you can clue us in, it would be most appreciated!